I couldn’t help but marvel. This morning I recorded brief congratulatory videos for a number of United Methodist congregations in Iowa that are celebrating anniversaries this fall. While I would love to attend each anniversary celebration, it is not physically possible. As I checked out websites and tried to get a sense of the history and ministry of each church, I wondered. How could these congregations last for 100, 150, or even 160 years? Over the weekend, on a brief visit to my father and family in Pennsylvania, Gary and I drove past the factory that my grandfather started in 1908. But something was different. Rock Community Church was the name on the sign in front of the building. William G. Nyce was an entrepreneur who founded Nyce Manufacturing Company, Inc. in a tiny village thirty-five miles northeast of Philadelphia. He was just twenty years old. My grandfather started out printing postcards and selling them to mom and pop stores in the area. The business expanded to include selling calendars, novelties, toys, and school supplies across the country and also became a thriving commercial printing company. Nyce Manufacturing Company closed sixteen years ago because of the erosion of its retail base by big box stores and the changing needs of printing in the 21st century. Never could I have imagined, however, that one day the factory would be a church! At the same time, there are some important parallels between longevity in a church and a business. First is the importance of customer service. One of my prized possessions is a framed invitation to the opening of the newly remodeled factory in 1924. We cordially invite you to inspect our new factory building during above mentioned days including evenings and become acquainted with our new home now practically completed. Come early or late, anytime to suit your convenience. We also take this opportunity of expressing our sincere appreciation to the many friends who have so generously accorded us their support in this undertaking. In our fifteen years of business experience, we have learned that the confidence and good will of our employees and customers and of our many friends and business acquaintances are our most valuable assets. We know this confidence and good will, which we consider a sacred trust, will be inspiration for the entire organization to still greater service in the distribution of our many products thruout the country. My grandfather knew that in order to be successful in business, he had to understand the context of the small general stores he served around the country, anticipate the needs of his clients and what might sell, and provide outstanding customer service. He did that exceedingly well. Second, my grandfather and then my father were always experimenting with new ways of doing business and were not afraid to fail. My grandfather tried different ways to expand the customer base, such as selling custom calendars and postcards that were printed in house. He also serviced the printing needs of the stores he served by offering business cards, stationery, envelopes, and invoices. Some things worked, others didn’t. 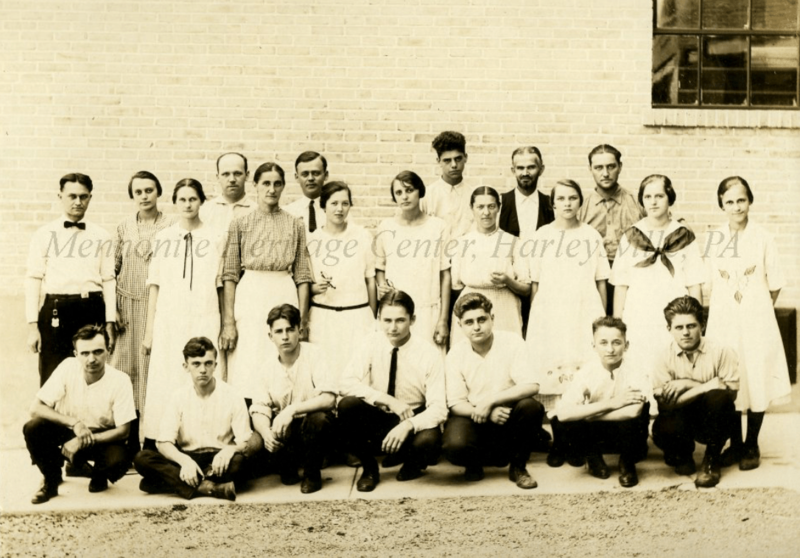 Third, those who led Nyce Manufacturing Company always treated their employees well. 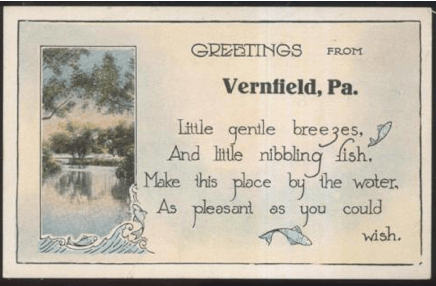 Employment was provided to many people in the small village of Vernfield, and they were highly valued. There was a Christmas party and an annual summer outing to watch the Philadelphia Phillies play baseball. Employees received vacation and a fair wage. They were like family, and Nyce was a highly respected business in the area. 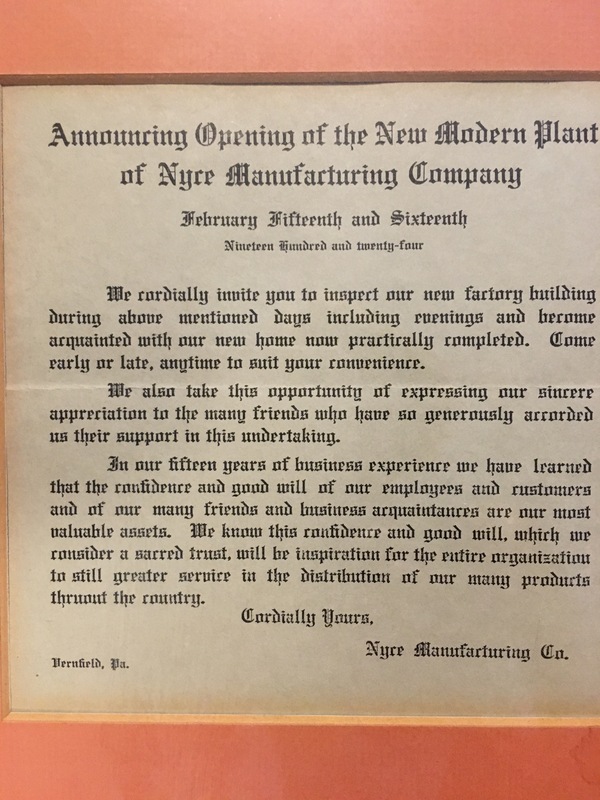 Nyce Manufacturing Company made a difference for an amazing one hundred and nine years, leadership having by then moved to the third generation. They were able to anticipate trends and adapt to changing business conditions. Eventually, however, the world started to change so rapidly that the business could not remain profitable. Now Rock Community Church continues a rich tradition of reaching out, serving, and giving back to the community. I wonder, will all of the churches that are celebrating major anniversaries this fall survive? As the demographics change in Iowa and other states, schools are consolidated, and small towns decline in population, can our United Methodist churches continue vital ministry to their communities? Not all of our churches make it. Some close, and remaining assets are gifted to other vital ministries. Some small churches consolidate, as is the case with Rock Falls UMC, which is celebrating its 150th anniversary. But they are also celebrating that twenty years ago, Nora Springs, Rudd, Plymouth, and Rock Falls UMC’s decided to a create a vital partnership called the Shell Rock Valley Parish. Still, other churches reinvent themselves and continue to love, serve, and change in order reach out to their communities. Recently, I watched a video presentation by Salim Ismail, who is the best-selling author of Exponential Organizations, a sought-after technology strategist, and a well-known entrepreneur. Ismail notes that any company that is still designed to serve the 20th century is doomed because it is not designed for the flexibility and adaptability of the 21st century, where the pace of change is accelerating at a rate that is mind-boggling. Every eighteen months to two years, technology in our world doubles in capacity and the price is cut in half. Most of us used to have a skill that lasted a lifetime. Now it’s more like seven years. A billion people in our world were online 2010. By the end of this decade, most of the 7.5 billion people in the world will be online. The characteristics of exponential organizations in this new future that Ismail cites apply to the church as well. How can The United Methodist Church reach out to tomorrow’s world in ways that make a difference? Have a massive transformative purpose that emphasizes continuous spiritual growth for all ages. Create a one-year operating plan that is updated in real time. Change is happening too fast for the traditional five-year plan. Invest in the latest technology to reach out to and communicate with your constituents. Encourage forward-thinking, risk, and flexibility. Use a horizontal and permission-giving form of organization: there is no longer time to go through a hundred hoops. Leverage your core capabilities in areas that will truly make a difference in your community and the world. Spin out a successful ministry, knowing that it will not last forever. Acknowledge the place of intuition and gut feelings as you lead through exponential change. Keep the main thing the main thing. People of faith still have tremendous influence in the world. Continue to share and model the unconditional, transformative, and inclusive love of Jesus, speak out against injustice and oppression, and invite all to join you on the journey of grace and hope. To all of the congregations in Iowa that are celebrating anniversaries: God bless you as you continue to love, serve, and change. Laurie you should be teaching a Business School course. 10 excellent points. Thanks so much, Cliff, and sorry for the late reply. I miss everyone at Birmingham and am so glad things are humming right along. Please give my love to your family.